When I was informed of transformative efforts to create a “winter wonderland” for Sandy Hook students as they return to a new school in 2013, I knew that my family would love to join in. Our hearts have been heavy with unspeakable devastation and we’ve been trying to take action in ways that we can. The Sandy Hook PTA and Connecticut PTSA has requested a beautifully simplistic way to help out – through creating and sending paper snowflakes. We made 26 total. Cut by Bob, glittered by little ones and mama – all made with love. In the midst of tragedy, I like to think of this simple gesture as a glimmer of hope, a homemade welcoming committee and a vision of beauty flooding the school hallways. Linking up with my friends The Chirping Moms in efforts to deliver cheer to Newtown, CT.
Love this! I saw this the other day. Can't wait to make something with the kids. Maybe it will help me too – I've been feeling such sadness over this. Cute snowflakes – adorable helpers!! There is something about cutting snowlakes and crafting as a family that feels so so good. I think it helped me and my husband and you raise an important point Lindsay – it fells good to help out. We told the kiddos that we were sending the snowflkes to kids who need them to cheer them up. I'm so happy to see the story spreading like wildfire – just imagining the end result adds a bit of hope. Oh my dear friend. We do think alike. My post today is also one about Hope and dedicated to the children at Sandy Hook. I'm so happy I stopped by and learned about the snowflakes, what a wonderful idea. 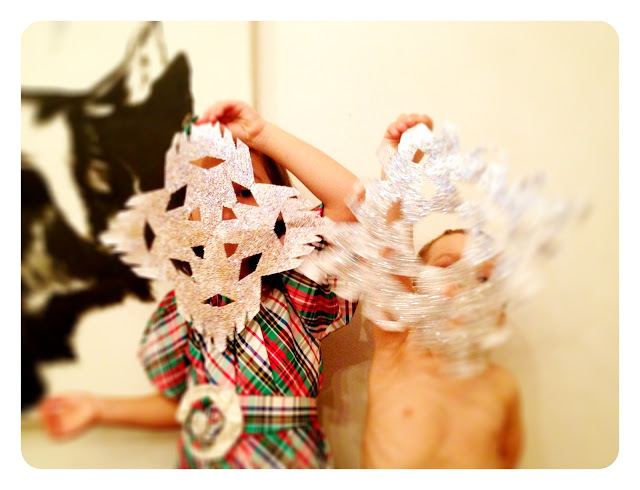 I can only imagine how cute your little ones looked as they decorated their snowflakes. I've already jotted down the address. It's so hard to feel helpless, especially as a parent. I think being able to do anything at all is a great way to start to heal, and to show our kids that anyone in the world can help others near or far. So glad you participated. I think any act of love, compassion and thoughtfulness – is the way to move forward. Such a simple way to show your love for Sandy Hook students, parents and teachers. Great idea and we're defiantly sending a few. Such a lovely way for people to help and show their love and kindness. Glad to have found you too Catherine. It is such a lovely little idea. Our school just did this yesterday! Great way to come together and show support! Our school just did this yesterday afternoon! What a wonderful way to show support and to stick together! Great idea! Oh, wow. What a great idea. We'll definitely be participating. Have you heard about that 26 acts thing? Such a beautiful family project. The glitter is a great idea to make them extra special. I'm wishing you and your family a wonderful New Year!